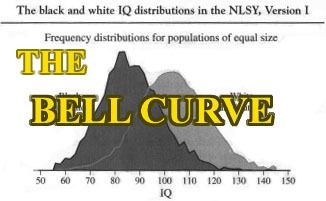 The Bell Curve, published in 1994, was written by Richard Herrnstein and Charles Murray as a work designed to explain, using empirical statistical analysis, the variations in intelligence in American Society, raise some warnings regarding the consequences of this intelligence gap, and propose national social policy with the goal of mitigating the worst of the consequences attributed to this intelligence gap. Many of the assertions put forth and conclusions reached by the authors are very controversial, ranging from the relationships between low measured intelligence and anti-social behavior, to the observed relationship between low African-American test scores (compared to whites and Asians) and genetic factors in intelligence abilities. The book was released and received with a large public response. In the first several months of its release, 400,000 copies of the book were sold around the world. Several thousand reviews and commentaries have been written in the short time since the book's publication. All standardized test of academic aptitude or achievement measure this general factor to some degree, but IQ tests expressly designed for that purpose measure it most accurately. IQ scores match, to a first degree, whatever it is that people mean when they use the word intelligent, or smart in ordinary language. The authors proceed to explain, using classical cognitive test results primarily, to explain how lower levels of measured intelligence impact an individual's, or indeed an entire class or group of individual's life in American society. The rest of the book is divided into four major parts. Part 1 (Chapters 1-4) describes the intelligence stratification of American society and the resulting emergence of a "Cognitive Elite". The essential conclusions of this Part of the book are that more intelligent (higher measured IQ) Americans are selected for college, and end up in fewer professions; American society is becoming cognitively stratified, with the Cognitive Elite crossing paths rarely with those of lower cognitive abilities. In the last half of the twentieth century, more and more Americans have been getting college degrees. College graduates have been funneled into a selective few occupations, especially for the brightest of the bright. The authors assert that more intelligent employees are more proficient employees, so that even among high-IQ professions like law, the highest IQ persons end up at the top. In addition, the authors argue that IQ tests could be the most important indicator of potential employee success, and therefore should be allowable as an input to the hiring process. A final point is made with respect to earnings based on cognitive ability. Since the cognitive elite are more proficient, they make more money, live in different areas, and send their children to different schools, churches, stores, etc. This leads directly to physical separation from the rest of society. Poverty - Low IQ is a strong precursor of poverty, even more so than the socioeconomic conditions in which people grow up. Schooling - Low IQ raises the likelihood of dropping out of school before completing high school, and decreases the likelihood of attaining a college degree. Unemployment, Idleness and Injury - Low IQ is associated with persons who are unemployed, injured often, or idle (removed themselves from the workforce). Welfare Dependency - Low IQ increases the chances of chronic welfare dependency. Parenting - Low IQ of mothers correlates with low birth weight babies, a child's poor motor skill and social development, and children's behavioral problems from age 4 and up. Crime - Low IQ increases the risk of criminal behavior. Civility and Citizenship - Low IQ people vote least and care least about political issues. Ethnic Differences in Cognitive Ability - East Asians typically earn higher IQ scores than white Americans, especially in the verbal intelligence areas. African-Americans typically earn IQ scores one full standard deviation below those of white Americans. The IQ difference between African-Americans and whites remains at all levels of socioeconomic status (SES), and is even more pronounced at higher levels of SES. Recent narrowing of the average IQ gap between black and white Americans (about 3 IQ points) is attributed to a lessening of low black scores and not an overall improvement in black scores on average. The debate over genes versus environment influences on the race IQ gap is acknowledged. The Demography of Intelligence - Mounting evidence indicates that demographic trends are exerting downward pressure on the distribution of cognitive ability in the United States and that the pressures are strong enough to have social consequences. Birth rates among highly educated women are falling faster than those of low IQ women. The IQ of the average immigrant of today is 95, lower than the national average, but more importantly the new immigrants are less brave, less hard working, less imaginative, and less self-starting than many of the immigrant groups of the past. Social Behavior and the Prevalence of Low Cognitive Ability - For most of the worst social problems of our time, the people who have the problem are heavily concentrated in the lower portion of the cognitive ability spectrum. Solutions designed to solve or mitigate any of these problems must accommodate, even be focused towards, the low cognitive ability profile if they are to have any hope of succeeding. Raising Cognitive Ability - If it were possible to significantly, consistently, and affordably raise intelligence, many of the negative consequences of societal low IQ could be mitigated or removed. However, historical attempts to raise IQ using nutritional programs, additional formal schooling, and government preschool programs (such as Head Start) have proven to have little if any lasting impact on intelligence as measured by IQ tests. The one intervention that has consistently worked to raise intelligence is adoption form a bad family environment into a good one. The authors recommend that children born to single mothers with low cognitive ability be voluntarily given up for adoption. The Leveling of American Education - The average American school child has not suffered from recent declines in overall school system measurements. Indeed, the focus of American public education has shifted more and more towards educating the average and below-average child to the exclusion of gifted children. Among the most gifted students, SAT scores have been falling since the mid -1960ís. No more than one-tenth of one percent of federal education spending is targeted towards the gifted students. As American education has been "dumbed down" to accommodate the average and below average students, the gifted students have been allowed to slide by without developing their true potential. The authors recommend that some federal education funds be shifted from disadvantaged programs to gifted programs, and that the federal government encourage parental choice in education through voucher programs, public school choice programs, or tax credits for education. A final recommendation is for educators to once again view as one of the chief purposes of our educational system to educate the gifted because the future of society depends on them, an education that fosters wisdom and virtue through the ideal of the "educated man". Affirmative Action in Higher Education - The edge given to minority applicants to college and graduate school is an extremely large advantage that puts them in a separate admissions process. Asians are a conspicuously unprotected minority due in large part to their above average intelligence scores. The cost of affirmative action in higher education includes the psychological consequences of students admitted under affirmative action programs, at lower cognitive ability levels, being seen as a low proportion of the overall student population, but a high proportion of the students doing poorly in school. This can lead to increased racial animosity and the high black dropout rate on American campuses. The authors recommend a color-blind affirmative action, giving preference to members of disadvantaged groups when qualifications are similar. Affirmative Action in the Workplace - Affirmative action programs in the workplace have had some impact, on some kinds of jobs, in some settings, during the 1960ís and 70ís, but have not had the decisive impact that is commonly asserted in political rhetoric. action does produce large racial discrepancies in job performance in a given workplace. Blacks have been overrepresented in white collar and professional occupations relative to the number of candidates in the IQ range from which these jobs are usually filled. The data suggest that aggressive affirmative action does produce large racial discrepancies in job performance in a given workplace. The authors recommend a color-blind affirmative action, giving preference to members of disadvantaged groups when qualifications are similar. The Way We are Headed - Three significant trends have emerged that, left unchecked, will lead the U.S. toward something resembling a caste society. These trends are: 1) An increasingly isolated cognitive elite, 2) A merging of the cognitive elite with the affluent, and 3) A deteriorating quality of life for people at the bottom end of the cognitive ability distribution. The authors see the continued polarization of society with the underclass anchored at the bottom, and the cognitive elite anchored at the top, restructuring the rules of society so that it becomes harder and harder for them to lose. The author's denouement of their prognosis is the coming of the "custodial state - an expanded welfare state for the underclass that also keeps it out from underfoot". The custodial state will have the following consequences: 1) Childcare in the inner city will become primarily the responsibility of the state. 2) The homeless will vanish. 3) Strict policing and custodial responses to crime will become more acceptable and widespread. 4) The underclass will become even more concentrated spatially than it is today. 5) The underclass will grow. 6) Social budgets and measures for social control will become still more centralized. 7) Racism will reemerge in a new and more virulent form. A Place for Everyone - In order to avoid the pessimistic custodial state conceptualized in the previous chapter, the authors propose a different scenario for American society in this chapter. The foundation to this alternative (more positive) scenario is the rethinking of equality and inequality. Stephen Jay Gould is a professor of zoology at Harvard University; he is author of The Mismeasure of Man, Hen's Teeth and Horse's Toes, and many other works. His article originally appeared in The New Yorker, November 28, 1994, entitled "Curveball." The Bell Curve rests on two distinctly different but sequential arguments, which together encompass the classic corpus of biological determinism as a social philosophy. The first argument rehashes the tenets of social Darwinism as it was originally constituted. Social Darwinism has often been used as a general term for any evolutionary argument about the biological basis of human differences, but the initial nineteenth century meaning referred to a specific theory of class stratification within industrial societies, and particularly to the idea that there was a permanently poor underclass consisting of genetically inferior people who had precipitated down into their inevitable fate. The theory arose from a paradox of egalitarianism: as long as people remain on top of the social heap by accident of a noble name or parental wealth, and as long as members of despised castes cannot rise no matter what their talents, social stratification will not reflect intellectual merit, and brilliance will be distributed across all classes; but when true equality of opportunity is attained, smart people rise and the lower classes become rigid, retaining only the intellectually incompetent. Howard Gardner is professor of education and co-director of Project Zero at Harvard University; he is the author of Leading Minds (1995) and Frames of Mind(1983). His article originally appeared in The American Prospect, Winter 1994, titled "Cracking Open the IQ Box." Leon J. Kamin is professor of psychology at Northeastern University; he is author of The Science and Politics of IQ, and with R. C. Lewontin and Steven Rose of Not in Our Genes. His article is an expanded version of a review that appeared in Scientific American February 1995. "Herrnstein and Murray rely heavily upon the work of Richard Lynn, whom they described as "a leading scholar of racial and ethnic differences", from whose advice they have "benefited especially". " Herrnstein, R. J. and Murray, C., (1994). The Bell Curve. New York: The Free Press. Jacoby, R. and Glauberman, N., eds, (1995). The Bell Curve Debate. Times Books.